Breath of Fresh Er: Happy 2014! 1. Eat healthier. While I was in the city this past week, almost every meal consisted of either pizza or hamburgers...not the healthiest way to kick off 2014. (Although it WAS delicious and completely worth it). This goal sounds almost too simplified but I'm especially hoping to incorporate more fruits and vegetables into my diet. I'd really like to try out some new salad recipes and eat salad for lunch or dinner several times a week. I'd also like to try out some different salad dressings. Right now I tend to gravitate towards the creamy, high fat dressings like ranch and caesar. Evidence of my NYC eating habits...Di Fara has the most delicious pizza. 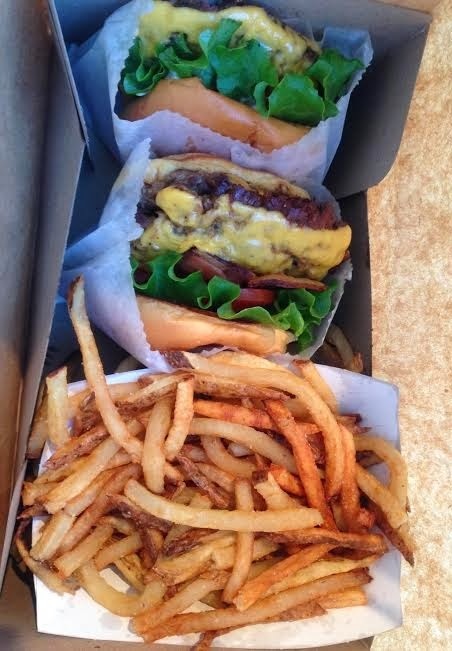 Shake Shack! I know the new fries are healthier but they weren't crispy. I missed the crinkle fries. 2. Spend more time blogging. I've got a lot of great ideas for recipes, diy projects, and other posts for this blog that I need to get working on. Ideally, I'd like to post 5 times a week. I got a new DSLR camera for Christmas which I'm really excited about using! It should make posting easier since my old DSLR camera took lower quality photos and wasn't working properly. These are my two main goals for 2014. I'd also like to vacation somewhere I've never been before and designate more time for reading. The list of books I want to read is always ridiculously long!